Acupuncture is the practice of inserting needles into the superficial skin, subcutaneous tissue, and muscles at particular acupuncture points and manipulating them. 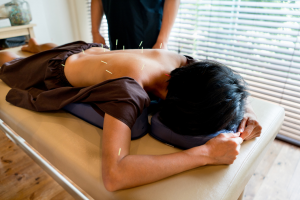 In TCM, there are as many as 2,000 acupuncture points on the human body that are connected by 12 main meridians. These meridians conduct energy, or “Qi,” between the surface of the body and its internal organs. Acupuncture is believed to keep the balance between Yin and Yang, thus allowing for the normal flow of “Qi” throughout the body and restoring health to the mind and body.